At the end of each year, I create the Christmas event poster design for my hometown library system in Kentucky. This is always one of my favorite seasonal projects to plan and execute. Muhlenberg County’s annual holiday events take place at their Thistle Cottage location. Thistle Cottage is a converted historic home which is located in the county seat of Greenville, KY. Many of the local businesses sponsor the Christmas trees that go on display throughout December at the Jubilee of Trees. Also, kids of all ages get to take pictures with Santa Claus himself one day during the proceedings. I love coming up with a new, distinct solution for this seasonal project each and every year. Since I had previously made liberal use of stock images for their campaigns, I was conscious that I may repeat myself. A holiday theme can be limiting if you don’t put much thought into it. Therefore, I wanted to try something different and distinct from past projects this year. Something special was in order! I conceptualized a simple, flat illustration which would make use of a minimal number of colors. Not unlike TV’s South Park, the cut out style gave the promotional material a lighthearted feel. First, I used the Adobe Illustrator application to create the focal image of the poster. 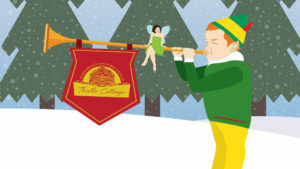 I drew up a pint sized elf playing a medieval style trumpet to announce the events. I actually based the illustration on a picture of my three year old son from his birthday photo shoot. He is wearing an outfit which is modeled after Will Ferrell’s character Buddy from the film Elf. The green and gold uniform is complete with a red feather in his cap. A royal red flag draped over the trumpet, heralding the December event dates. I used a mix of antique style fonts that looked like they could easily adorn a Middle Ages castle. A tiny, smiling fairy is sitting cross legged atop his trumpet. She holds a sparkling wand in her hand, and plotting holiday mischief. I actually based the pixie’s image on a photo I had taken years ago of my wife. I added wings and recolored her dress green like Disney’s Tinkerbell. The snowy background scene in the posters consists of rolling hills and pine trees. I desaturated the trees’ colors to dull hues in order to make it obvious that they were far off in the background. The hill in the distance is also slightly darker to achieve that purpose. In addition to the elf and fairy, the foreground elements announce the ongoing Jubilee of Trees. I continued using the simple logo I created for the event years ago. Also, a “want ad” style poster provides all of the details for the Pictures with Santa event. I chose a simple, one color “hipster” interpretation of Old Saint Nick. The silhouette image comes complete with ironic horn rimmed glasses. The client asked if the Santa Claus image was me, since my wife and son depicted the fairy and elf, respectively. A bright red waving banner with gold trim displays across the top. I set the poster’s main title in an Old English style font called “PlainBlack”. Many fonts I considered from my font book were perfect, stylistically. Unfortunately, they were also too hard to read. That is a big no-no for a poster design, especially for the main title text. I made sure to select the perfect font, which was both legible and regal. The white space at the bottom displays a list of event sponsors. The Thistle Cottage logo I designed years ago also displays in a pale shade of blue. Last of all, I sprinkled faint snowflakes throughout the scene. 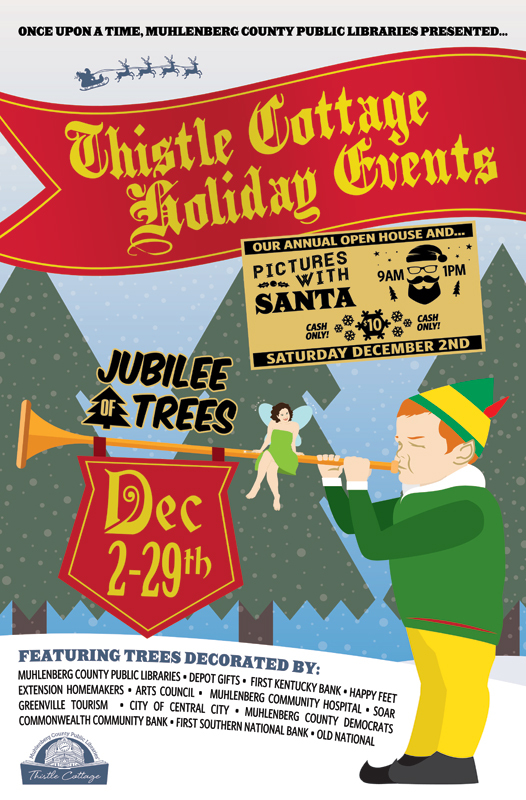 The simplified Facebook ad featured my Thistle Cottage logo on the elf’s flag instead of the dates. After I finalized the design, the library distributed the final product in a variety of print sizes. First, they needed it in the largest print format, which was an 11×17″ poster. I then resized the elements and rearranged them to fit in a half page handout. Next, I created two different sizes for two local papers’ print newspaper ads. Both of the publications have their own sizes and specs, so I had to follow them closely. They also promoted the event extensively on their social media channels. I modified the design so that it would properly fit on the public library system’s Facebook Event page. Facebook’s graphics specs limit the amount of text that advertisers can use. The graphics themselves also need to be formatted so that the feature images are positioned in specific locations. This way, every part of the image will display as it should, regardless of which device is being used. Thus, I had to get creative so that I could fit it to that mold. This was no problem for me, of course. I always make sure to stay informed on current social media advertising trends. The staff at Muhlenberg County Public Libraries always tell me how much they love my work. Why not try me for your own event ad campaign? 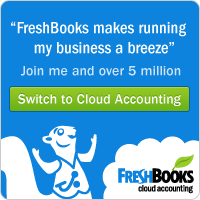 You might just become one of my repeat customers as well! Contact me today to get started!